Today is a special day - I've been blogging here for 5 years! I recently looked back through my posts (right sidebar) to see how my blogging has changed. Believe it or not... here's my first post! 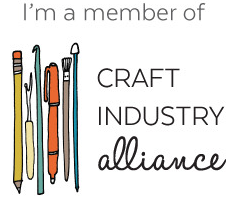 I've made friends, hosted blog hops and quilt-a-longs, written tutorials, and created many things. 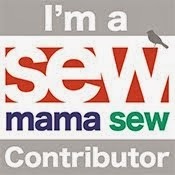 Blogging to me is about keeping track of all of my makes and methods but also interacting with the community involved. I started out with just my sister reading (hi Ris!) but I got a lot more chatty with the CJMQG, other bloggers, and Instagrammers. I love contributing to this community, and I love writing. As a result, I'm starting a bi-monthly newsletter, The Wonky Press! The first issue will go out on October 1st. If you'd like to hear more about it, I'll be back later this week to explain (two things I can guarantee: exclusive content related to modern quilting and community involvement!). If you'd like to sign up for the mailing list right now, you can! This year I'm offering a handmade giveaway that is similar to last year's; I'll make you a mini quilt based on your color and design choices! To enter: Please leave a comment about what kind of mini quilt you would want (Size? Improvisation? Curves? Quilt-as-you-go? A certain pattern? Quilter's [my] choice? Dense or not-dense quilting? Which colors?). If you enter, please give it some thought. :) You can answer any of the questions - I can't wait to read about it. Thank you for being such a wonderful community to be a part of! Please exclude me from this giveaway, as I'm already the happy recipient of two of your quilts! But I wanted to say yay! How awesome five years! Congratulations! ...and is your mailing address supposed to show up when I subscribe to your newsletter? Thanks Renee! And yes, it is. Mailchimp requires you to use it. Congratulations, how awesome 5 years. I'd love to have a Quilter's choice, it would be great to receive a small quilt made by you. Also, I follow you on Instagram! I'm @Stand4da96 and my email address is Luv2FollowChrist@yahoo.com thanks for such an awesome giveaway and congrats on such an accomplishment over the past 5 years! Congratulations on your five year blogiversary, may you have many more. I'd love to win one of your mini quilts, size wise I think 16" is a nice size, I like improv rectangles, squares and triangles, Gees Bend inspired, the quilting could be organic lines and organic echo quilting, fairly dense, and well, my favourite colour is blue, all shades of it. Thanks for the chance to win. I like curves and modern quilts. Yellow, green are favorite colors. Easy peasy. Anna Maria Horner and orange peels. Because i love the quilts you have shown. And i follow you on feedly. I am following you via Bloglovin and IG, thanks again... You are a sweetie!! you are so generous! Congrats on 5 years! If I were to win I would love a quilt that utilized jewel tones, deep saturated colours and then a back ground of low volume/multi neutrals... I also love the idea of a medallion quilt design... I enjoy dense quilting.... honestly anything you make is fantabulous!! thanks for the chance to win! Congratulations friend! I'm so honored to have a piece of your artwork hanging in my office where I can look at it every day <3 I love it so much! Oops, it looks like my first comment didn't publish ... Let me try again. If I were lucky enough to win, I'd love a quilt of your choice--something that you think represents you and your quilting style. Congratulations on your fifth blogiversary. Woo hoo! Congratulations on your fifth year! If I were to win one of the mini-quilts, I would pick quilter's design, but request the use of Allegory Story fabric collection by Windham. I'm in love with this collection and would love something made just for me, by you! Ooooh..I love your Rainbow of Pearls!!! Also the Teal Peek! Your are soooooo talented!!! thanks for chance to win something you have made! It would be a special Treasure to me. Congratulations on 5 years! I'd love to have one of your mini quilts in red white and blue, featuring stars and strips! Congratulations on your 5 year blogiversary. Here's to staying power. I like saturated rich colors and creativity. My choice of a mini would be Quilter's Choice as I want to give room for creativity and free flowing thoughts. Thanks for such a personal give away. I would love to own one of your mini quilts. You may consider yourself new to quilting, but you have a fresh take on it that I just admire. I would just love to have a mini version of your Cascade Pebbles quilt. It is probably my favorite quilt made by anyone ever! So peaceful, and I can almost hear the water flowing just looking at it! I think it would be fabulous with aquas and grays and that fabulous pebble and matchstick quilting you do. Maybe 14 - 16" x 20". Yep, I can just make it out in my mind's eye. Congratulations to your 5 years! And wow, what an amazing give away! I would love your choice as all the things you make are just lovely. Colorwise: I am a blue and purple girl. As far as I'm concerned, your signature design is orange peels. Eep! I would love an orange peel mini in shades of yellows, reds, and greens. I follow via IG and Bloglovin'. Pick me, pick me, PICK ME! congratulations on 5 years blogging! Reading that made me realise I had my 5-year blogoversary last month but completely forgot! I'd love to win a handmade mini, made by you! I'd definitely go for dense quilting as I love your quilting. The design would be your choice as I like your aesthetic, but I'd ask you to stay away from hexies as I don't like them, also prints by Tula and AMH as I'm not a fan. I love blues and greens, but I also like red. Not pink, though pink in a rainbow or graduation of colour is fine! Congrats on 5 years! That is a huge accomplishment. I would love a rainbow of colors but the pattern of your choice. Your work is beautiful! Many congratulations Jess! You know I love reading your blog :-) I would choose your amazing improvised piecing, orange peels, Anna Maria Horner and of course your brilliant quilting! And I follow you on Bloglovin! Congrats on 5 years! Your orange peel quilt along last summer inspired me to make a fun Dr. Who baby quilt for my niece's little guy. I didn't get it done in time to participate, but I finished it earlier this spring. Thank you! I would love a mini made by you--I would choose orange peels--with your choice on design. I love color--especially striking contrasts. I love your rainbow of pearls above. I would love a mini designed by you, thanks for the chance to win. I would want you to make whatever you felt inspired to make. I love dense quilting and tons of color. Congratulations on the five year mark! You write a wonderful blog! And of course I follow you! On bloglovin. I'd love a mini quilt of your choice since I could use a little purple in my life! Congratulations on your first five years!!! I would love a mini quilt that uses my favourite mix of colours which is aqua and red, with a little white and navy thrown in maybe. My favourite fabric designers are Bonnie and Camille because they make such 'happy' fabric. I love applique, curves, dresdens, and free motion quilting (I struggle with the quilting side myself). Thank you for a fun giveaway. Love all your mini's, super cute! Love the dense quilting and the improv. Hmm something red orange yellow green and blue. Okay rainbow, bright! Fun! All the things you do best! Thanks for your blog! Congrats on 5 years. 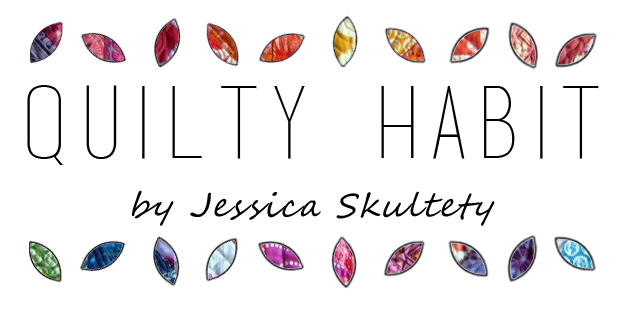 i follow quilty habit on blog lovin'. i would love a rainbow mini 20X20. thanks for the chance to win. Your Sunrise mini quilt is awesome. I'd like something like that with the orange peels. I love your handmade giveaways!! I am always envious of the winners :) I love aquas and greens, white, greys, navy blues.... Curves are cool, so are orange peels - any designer, any quilting!! I would just be thrilled to have one of your creations!!! I am a 'gfc' follower - happy hump day!! Oh my gosh. I rarely enter giveaways but this is an amazing offer!!!!! You are so generous! The fun thing about mini's that you get from someone else, is to let the artist shine through. So I wouldn't want to micromanage your creative genius ;) But, since you asked I would love for a mini with some crazy improv curves and some amazing FMQing including pebbles. I've never tried pebbles on my own and am dying to hang some up in my sewing room. I love aqua and coral colors and don't love when things get toooooo busy. Thanks again for this wonderful giveaway. I've got you covered via blogger and Bloglovin but am headed to Instagram to follow you there also. Oh wow! loving this giveaway I also love scraps and making up as you go not one for rules so anything would be fabulous loving brights all the colors of the rainbow and also chocolate too!. I'd love a Quilters Choice mini quilt!! Oh my word, what an amazing thing to consider. Because it is you, I would say, orange peels, or designs created from orange peels such as your Rainbow of Pearls configuration. I love Anna Maria Horner, pretty much any and all. I like deep, rich shades, and even her blues and purples have a warmth to them, don't you think? I am so impressed by your dense quilting--and am worlds away from even attempting it--so if I won, I'd be thrilled to receive something quilted pretty heavily, especially since it will be displayed on my wall, as the artwork it is. Thanks so much for the giveaway, but mostly for the time and effort you put into this blog. It really does bring a lot to my days. I live on a farm on the West Coast, without a lot of contact with other quilters, and your "visits" inspire me and make me smile. A warm hello to your sister, too--how is she liking school? Wow, I really have to enter to this giveaway. 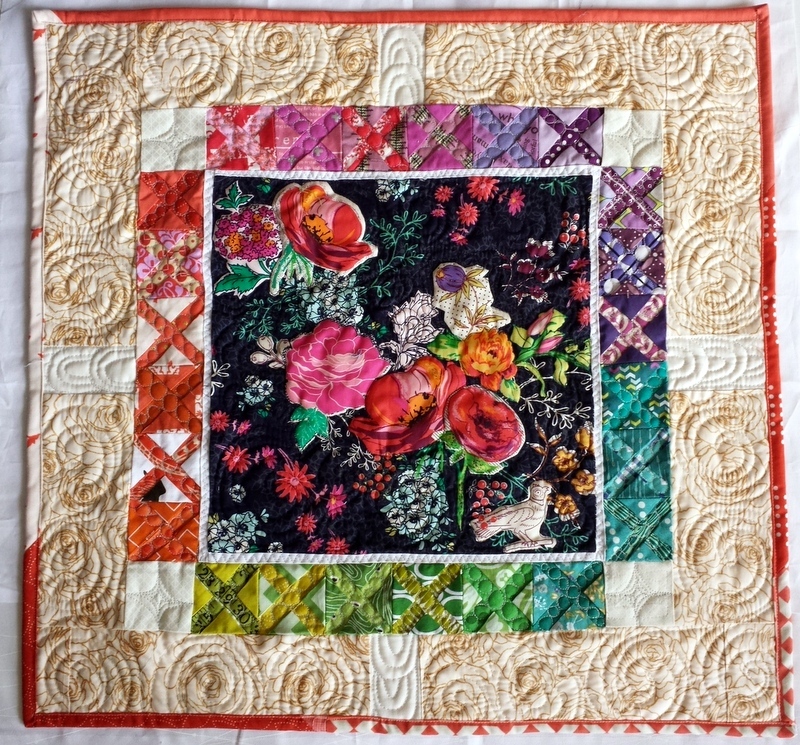 Bright, rainbow colours, orange peels and your wonderful quilting. Swirls. Those would be great. I follow you on ig also. Congratulations on you anniversary! 5 yrs is a long time! If I won I would pick rainbow colors and a swirly quilting! Thank you for the opportunity! I follow your blog. By email. Congratulations on 5 years and more to come!! I do follow your blog by email and if I win , Teal Peek will be my choice.Thanks. I've been blogging for six years - time fly's by and I enjoy re-reading some of my older posts - brings up some memories. If I win... So many directions. I love turquoise and aqua colors but I would like to play with tone on tone using japanese yarn dyed fabrics -- maybe with some three-dimensional features, maybe some sashiko hand-stitching. I also love to fly and would enjoy a bird's eye view up there with quilting taking care of the rectangular houses and straight and curvy roads. I would enjoy anything you dreamed up - incredible offer on your part. I will add, I just won a two year blogaversary prize which was amazing and I made something for the giver as a second thank you. Congratulations! What a wonderful milestone! If I win, i would like something along the lines of the Rainbow of Pearls. 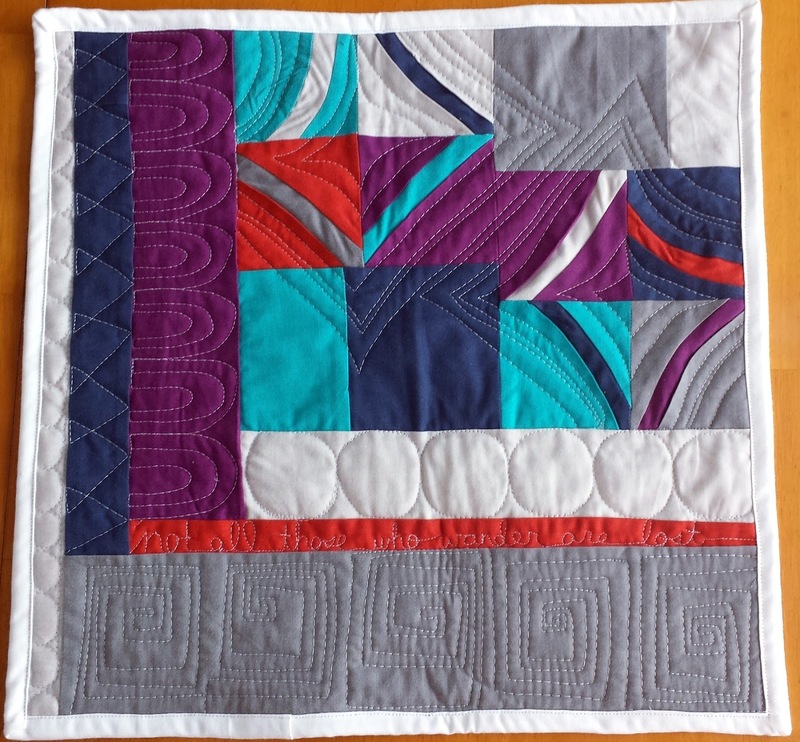 I like blues and purples, with medium density quilting. I like traditional themes, like stars. Five years! That's so great. Thanks for inviting us to be part of your celebration! I would love a mini quilt, your choice! Thanks, and congratulations! Ps--I follow you on bloglovin! I would love something with cheery colors, maybe red, yellow, green and whites, something like your rainbow of pearls colors, also I like curves. I am now confined at home mostly, but I won't let Lupus win ! :) So I would love something happy! Thank you for the opportunity. I would love something that combines black & white low-volume fabrics (especially with text, numbers, etc.) with teal (blue/green) and purples. I like your improv orange peels, and that's something I'd probably never do for myself because I don't like to do applique. I'd love to have the peels be colorful and the background to be pieced B&W and low-volume more muted colors. I would want a rectangular quilt rather than square, and I'm sure I can find space on my sewing room wall for whatever size/dimensions it ends up. Thank you again! I know whoever wins this will be thrilled with whatever you make! Congrats on your five years! Congratulations! What a lovely idea and way to celebrate! It would be a pleasure to have a mini made by you. I particularly like "Wanderer" but I would prefer to let you choose what inspires you at the moment. 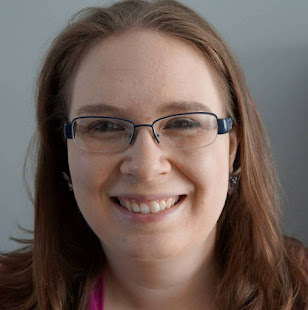 Congratulations on your blogiversary! So generous of you to offer to make a mini. If I won, I would love something your choice, with lots of quilting, in either rainbow or "beachy" colors (my sewing room has mostly sand-colored walls with one nice bright teal-y blue). I follow you on blogloving! Congrats on 5 years! I would love a quilters choice quilt with rainbow colors. Thanks for the generous giveaway. Congratulations! I'd love an orange peel mini because if I'm going to win something from you, I'd love it to be something that's very "you." Same goes for the quilting; I usually prefer less dense quilting, but I'd like to see some of your quilting in person. I especially like when you write words into the quilting. Thanks! I follow you on Bloglovin' and IG. Thanks! I like the sunrise quilt but would like deep fall colors and olive green leaves. Thank you! Would love an imrovised quilt infresh colors (turquoise, lime, orange) as I would love to do some impov quilting myself. I love your "Wanderer" and purple and pale green would suit me fine. If I don't win I might just improvise something with those colours anyway. Unfortunately, I have more ideas in my head than there are hours in the day! I follow you by email, but I've also copied your blog address into my blogger list; that way posts are easier to read on my iPad. Happy Blogiversary! Thanks for the fun giveaway. If I were to win one of your pretty minis, I think I'd like something rainbow or at least in shades of blues and purples and I really like your orange peels - I've never done orange peels. I love your rainbow of pearls. And ..I follow your blog. Congratulations! If I were to win I think I would choose X marks the spot.or maybe Sunripe or Rainbow...all are beautiful!. I love them all but Rainbow of pearls us definitely for me! Jess, I love Cloud Atlas too! My ideal mini quilt would be of Sonoran desert sunset colors, hot, warm and bold w/a some turquoise in the mix as that's my favorite Arizona gem:) Oranges, coral, reds, golds, citron . Quilters choice, not so dense...serene like. oops omitted the size 16-18"...spirals are my favorite. Jess I'm a follower via email. ALso sub'd to your Wonky Press bi-monthly news! Cant wait to read Octobers first. Thank you again. Congratulations on reaching such a big blogging milestone! I really love your color sense and would be thrilled with anything you come up with. Original designs (including improvisation) are always my favorite. Congratulations on your blogging anniversary! I enjoy reading your posts! I would like a mini with words on it like the wooden letter words I have up on my wall over the closet doors. I have 'Dream' in pearly white, 'Create' in limey green, and 'Sew' in teal. I may not put the wooden letters up in my next sewing space, so it would be great to have them on a mini quilt. Awesome! Congrats on 5 years!!! I really want to learn to quilt as you go. I think a mini quilt would be an awesome way to start. I find that after I have finished a project, but need to quilt it, my steam seems to be gone. I think quilt as you go might help me with that. Thanks for the chance. I follow you on blog reader and of course IG good luck, looking forward to seeing your newsletter. Would love one of your famous Orange peel mini quilts, beachy colors would be great. If I should be so blessed as to win The 20" is perfect. I prefer shabby chic style of some sort in teals, browns and maybe a little pink. This will be placed at the head of my 3/4 iron bed and posted on my blog. Oh, I think I just got a little ahead of myself. Talk about the power of positive thinking. 8-)). Congratulation on the 5th anniversary of you blog. I see many more coming. Oh to be young again. The string of pearls is very nice in a 20" in yellows, oranges, and red. 5 years is awesome!!! I follow with email. Then again a nice new pattern design of a yellow sun peeking up from a corner sending off rays of oranges, and reds with a greenish background would be fun and interesting. congratulations on 5 years! I love all the different rainbow designs ... Flying geese, circles hexes, anything. thank you for the chance to win. Teaching at Rock Paper Scissors in Montclair, NJ! Selvage Along: Final Link Up! The Wonky Press - A Newsletter!